172 Beacon is located on the north side of Beacon, between Berkeley and Clarendon, with 170 Beacon to the east and 180 Beacon to the west. 172 Beacon Street was designed by Bigelow and Wadsworth, architects, and built in 1927-1928 by the F. J. Van Etten Company, general contractors, as a ten story (plus basement), ten-unit apartment building, built for the 172 Beacon Street Trust. Click here for an index to the deeds for 172 Beacon. 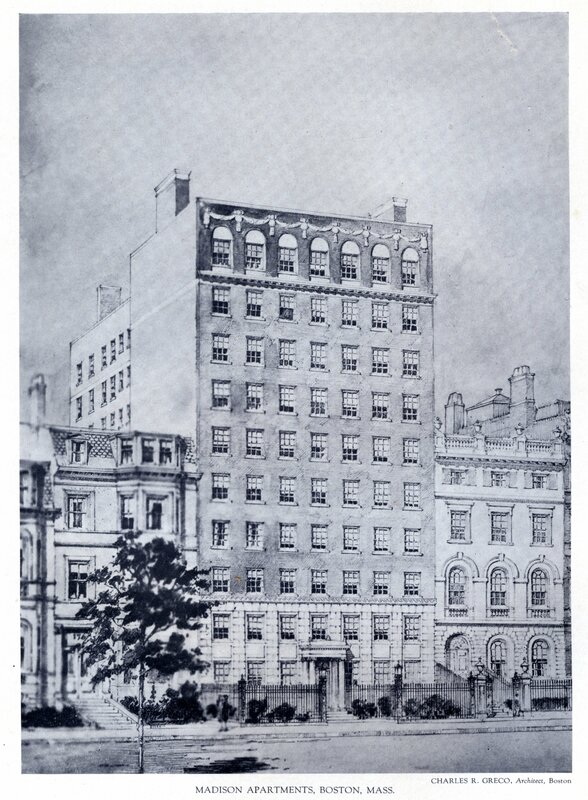 A drawing of the building as planned appeared in Achievements of New England Architects and Engineers, published in 1927 by Lewis J. Hewitt. The two existing townhouses at 172 and 174 Beacon were razed, but the project did not go forward and on January 19, 1928, The Madison, Inc., sold the land to real estate dealer Richard DeBlois Boardman (of the offices of the T. Dennie Boardman company), as trustee of the 172 Beacon Street Trust. Bigelow and Wadsworth’s plans for the building — including elevations, floor plans, foundation and roof plans, and framing plans — are included in the City of Boston Blueprints Collection in the Boston Public Library’s Arts Department (reference BIN N-24). The original building permit application was filed on November 3, 1927. The permit was denied because of lack of egress and ventilation, but was granted on appeal by the Board of Appeal on November 11, 1927. On June 28, 1935, 172 Beacon was acquired from the 172 Beacon Street Trust.by One Seventy Two Beacon Street, Inc. On October 15, 1947, it was acquired from them by the 172 Beacon Corporation. On December 28, 1977, the 172 Beacon Corporation converted the building into ten condominium units, the 172 Beacon Condominium. The building replaced two townhouses at 172 and 174 Beacon. 172 Beacon was built ca. 1861 as the home of Richard Sullivan Fay, Jr., and his wife, Elizabeth Francis (Bowditch) Fay. They previously had lived at 10 Pemberton Square. Elizabeth Fay purchased the land on which 172 Beacon was built on December 5, 1860, shipping merchant and real estate investor John Lowell Gardner, who had purchased it on June 7, 1860, from the Boston and Roxbury Mill Company. John L. Gardner and his wife, Catharine Elizabeth (Peabody) Gardner lived at 7 Beacon, and would build a new home at 182 Beacon in the mid-1860s. In the Appendix to his Houses of Boston’s Back Bay, Bainbridge Bunting indicates that 172 Beacon was one of three contiguous houses (172-174-176 Beacon) built for East India shipping merchant Robert C. Mackay. Based on the deeds, this is incorrect. Robert Mackay owned the land where 174-176 Beacon were built, but not the lot where 172 Beacon was built. Click here for an index to the deeds for 172 Beacon (Demolished). Richard Fay was treasurer of the Middlesex Manufacturing Company of Lowell, which owned and operated woolen mills. By 1865, the Fays were joined at 172 Beacon by Franklin Gordon Dexter and his wife, Susan (Amory) Dexter. They previously had lived at 48 Charles. He was a shipping merchant. 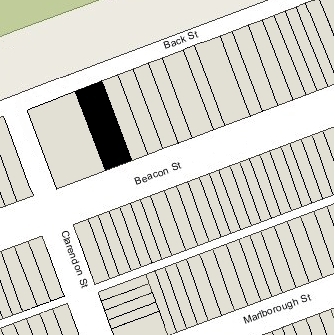 By 1868, they had moved to 9 Marlborough. Richard Fay died in March of 1882. Elizabeth Fay continued to live at 172 Beacon, and July of 1891, she married again, to Gardiner Greene Hammond, a widower. After their marriage, they lived at 172 Beacon. Gardiner Greene Hammond died in March of 1903. Elizabeth Hammond continued to live at 172 Beacon until her death in May of 1924. 174 Beacon was built ca. 1861, one of two contiguous houses (174-176 Beacon) built for Robert Caldwell Mackay and his wife, Charlotte Langdon (Lodge) Mackay.They were originally numbered 138 Beacon and 139 Beacon, but were re-numbered as 174 Beacon and 176 Beacon ca. 1862 when homes were built on the south side of the street. Robert and Charlotte Mackay lived at 176 Beacon with their unmarried son, George Henry Mackay. 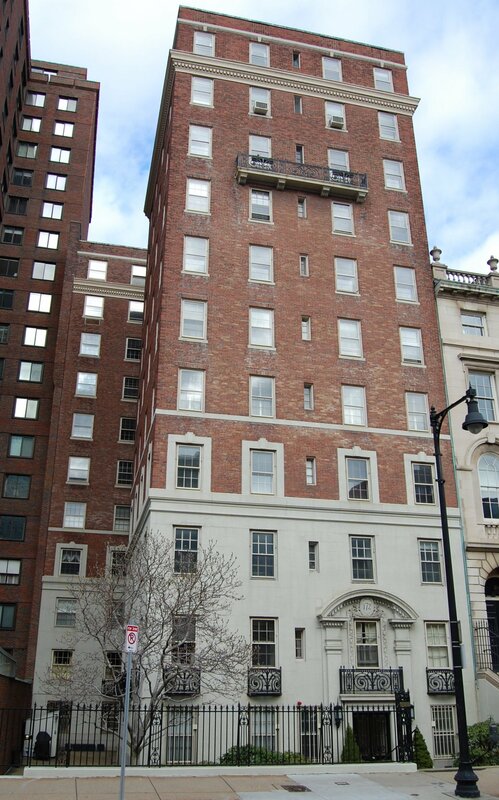 Their older son, William Mackay, and his wife, Susan Haslett (McKim) Mackay, lived at 174 Beacon. They all previously had lived at 127 Tremont. Robert Mackay purchased the land on which 174-176 Beacon were built on June 7, 1860, from the Boston and Roxbury Mill Corporation. On July 3, 1860, he transferred the land for 174 Beacon to William Mackay. Click here for an index to the deeds for 174 (Demolished). Robert Mackay was a shipping merchant in the East India trade. William Mackay and George Mackay were partners in their father’s firm. William and Susan Mackay lived at 174 Beacon until about 1865, when they moved to New York City. On October 4, 1865, 174 Beacon was purchased from William Mackay by Samuel William Rodman. Samuel Rodman was retired from the whaling business in New Bedford. He and his wife, Emma (Motley) Rodman, lived at 33 Charles in 1865. They do not appear to have moved to 174 Beacon for several years and probably were traveling abroad. By 1870, 174 Beacon was the home of Francis L. Lee and his wife, Sarah Mary Ann (Wilson) Lee. In 1869, they had lived in Newton. Francis Lee was a landscape architect and had served as Colonel of the 41st Massachusetts Infantry in the Civil War. They also maintained homes in Chestnut Hill and in Westport, New York. By 1872, they had moved to 254 Beacon. By 1875, Samuel and Emma Rodman had made 174 Beacon their home. During the 1878-1879 winter season, the Rodmans were living elsewhere and 174 Beacon was the home of retired merchant William Gardiner Prescott and his wife, Josephine Augusta (Peabody) Prescott. The Prescotts also maintained a home in Pepperell, Massachusetts. They had lived at 188 Beacon in 1878. By 1880, they had moved to 286 Beacon, and the Rodmans were living at 174 Beacon again. During the 1884-1885 winter season, the Rodmans were again living elsewhere and 174 Beacon was the home of jeweller and bank president Abraham Orlando Bigelow and his wife Olivia A. (Dodd) Bigelow. Their primary residence was in Jamaica Plain. They had moved to 318 Beacon by the next season. By the 1885-1886 season, the Rodmans again were living at 174 Beacon. Emma (Motley) Rodman died in October of 1889. Samuel Rodman continued to live at 174 Beacon with their unmarried daughter, Emma. Samuel Rodman died in June of 1906. Emma Rodman continued to live at 174 Beacon until about 1924, but had moved to 68 Beacon by 1925. On August 12, 1924, 174 Beacon was acquired from Emma Rodman by attorney and real estate dealer Walter Howard Gleason. He and his wife, wife, Mabel W. (Robertson) Gleason, lived at 183 Beacon. On February 16, 1925, 174 Beacon was acquired from Walter Gleason by real estate dealer William N. Ambler. The property subsequently changed hands and on May 14, 1925, was acquired by Agnes M. Roche. On the same day, she also acquired 174 Beacon. Agnes Roche appears to have been employed by a civil engineering firm in Cambridge. The two lots were subsequently surveyed and combined, and on December 23, 1925, they were transferred to The Madison, Inc. Both houses were razed soon thereafter.